Traveling across time zones reminds me that sleep is something to be enjoyed and savored. Whenever I travel west I wake early too early in the morning. While I love to watch the world awaken and shake the darkness, seeing the clock crawl past 4AM can be a bit frustrating. On one hand, I am usually awake by this time in the time zone where I live, but on the other hand, I face a long day ahead an hour further along in my awake cycle meaning I get numb mentally sooner. But I do enjoy watching the day arrive. The darkness being chased from the sky by the arrival of the light--first the reds and then the golden rays as the sun climbs up over the horizon and into view. It is exhilarating to be present at the start of the day. 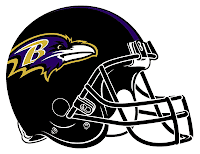 Today the dawn provides the beginning to a special day--it is the beginning of the NFL season with the Ravens facing the Broncos. It is too bad that football is so short when measured by baseball. But, it does generate a lot of interest.